The Subway Alumni are a group of Notre Dame Fighting Irish fans who are known for their strict allegiance to the school although never attending or graduating from the school. In the early days of Notre Dame football becoming a national powerhouse, the Subway Alumni received its name because so many of the fans were from New York City and traveled by subway to and from the Army vs. Notre Dame games throughout the New York City area. They were immigrants who had come to America to find a better world. They felt if this small university in the Midwest could win over the bigger schools, then they could win over whatever stood in their way of a better life for their families. In years to come, the Subway Alumni would expand throughout Philadelphia, Chicago, Boston and cities all over the country and abroad. The spirits of tens of thousands throughout the country, many of whom had never set foot on a college campus, became enamored of a team and a university, although small, that could win big. These followers of Notre Dame football would too become known as the school's "Subway Alumni". Today, the Subway Alumni is a network of loyal fans, too many to count with legacies dating back several generations. Their passion and roots are as real and loyal as any alumni to any school in America. Charlotte and David are proud to be known as "Notre Dame Subway Alumni". 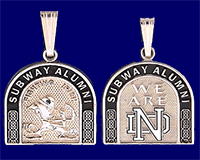 Their Subway Alumni design which is shaped like the subway tunnel denotes this with the words "We Are ND".